Gino Bartali is a legendary Italian cyclist from the pre- and post-World War Two era who won the Giro d'Italia three times and the Tour de France twice, as well as Milan-San Remo, Tour de Suisse and many other races. He holds the record for the longest time between two Tour wins - 1938 for his first and 1948 for his second. 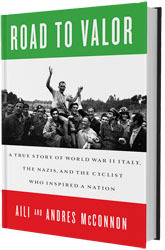 For these accomplishments alone, he is considered one of the greats of cycling, however, when the writing team of Canadian journalist Aili McConnon and her husband Andres published the book Road to Valour (note: the U.S. edition spells it as 'Valor') in June of this year, it revealed that Bartali was also a war hero who helped save the lives of hundreds (if not thousands) of Italian Jews threatened with concentration camps and execution. The book is not strictly a cycling book, since it does not focus on Bartali's entire cycling career; it stops abruptly after his 1948 Tour win, with no mention of his second place in 1949, while supporting his great rival Fausto Coppi, or that his career lasted until 1954. It does, however, provide a detailed look at a strong and flawed personality who lived by an extremely rigid personal code, as well as a fascinating and well-written account of the world of cycling in the mid-twentieth century. This was a time when racing conditions were truly horrific (by modern standards), with Tour stages approaching 400 kilometres, on dirt roads through the mountains. Cycling was a sport of the people, and a way for talented individuals to lift themselves out of grinding poverty. The research for Road to Valour is meticulous, with the authors having conducted interviews with Bartali's widow Adriana (he died in 2000), son Andrea, former teammates, friends and Jews that he helped save during the War. A picture emerges of a man who, while vain and egotistical, was deeply religious and lived by his convictions, even when it clearly could have endangered his life and that of his family. Bartali used his fame as a cyclist to cover the fact that he was busy transporting forged documents hidden in his bicycle frame through Nazi and Facist held territory while ostensibly 'training'. The documents helped Italian Jews escape persecution and, at times, certain death. He also hid a Jewish family for much of the war in the basement of a property he owned, and provided intelligence to other members of the network of Catholic church clergy and others who produced the documents and hid Jewish families. After the war he still kept quiet about his part in this resistance movement, and this book is the first widespread revelation of the accomplishments of this remarkable man. A book well worth reading whether you are a cycling fan or not.